Given the relentless hype for the main event, it’s been easy to forget that there is actually an undercard to UFC 189 on Saturday but that undercard would probably be amongst the best PPV cards of the year even if both Conor McGregor and Chad Mendes suddenly got injured. 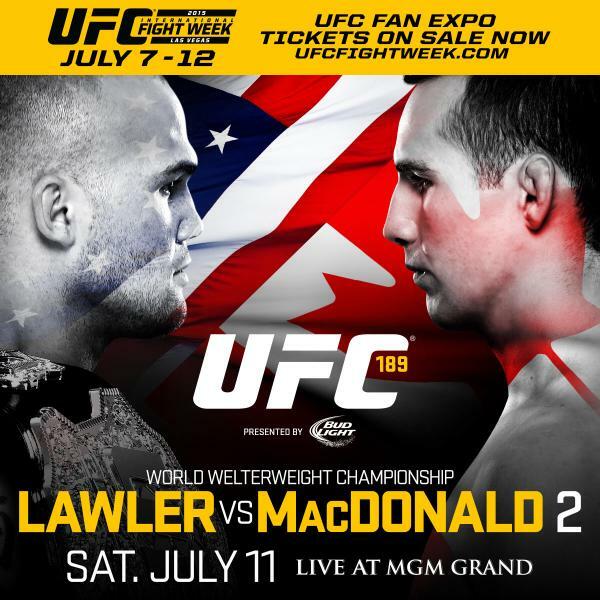 The co-main event itself is a fight worthy of headlining any MMA card as Robbie Lawler (25-10, 1NC) looks to make the first defence of his UFC Welterweight title against Rory MacDonald (18-2). Robbie Lawler’s career would make an excellent movie trilogy, all the way from the youthful prodigy through his journeyman years in the wilderness to his triumphant UFC return and title victory. 6-1 since returning to the UFC and dropping back down to Welterweight, Lawler seems to have reached a point in his career where natural talents, coaching, experience and a maturity have moulded him into a complete martial artist where his always dangerous striking is fully in accord with his grappling game, cardio and mentality. By contrast, Rory MacDonald has seemed like the heir apparent to the welterweight throne for years. A protégé of former champion Georges St-Pierre, it seemed that MacDonald was always the new big thing at 170lbs even as losses to elite fighters Carlos Condit (losing to a late KO after dominating the fight for three rounds) and Lawler (via split decision) checked his progress towards the seemingly inevitable title shot. Nonetheless, MacDonald rebounded from both losses by becoming a more dangerous, more complete martial artists and in the five years since first tasting defeat in that fight against Condit. Now, one of the sports most beloved and skilled veterans faces off with one of the preeminent examples of a modern, well rounded, cerebral and above all, professional MMA fighter with the belt on the line. What more could you ask for? Well, a promoter would ask for one of them to be a bit mouthier and turn a credible sporting contest into a bit more of a media sensation, but a certain Irishman seems to have pegged the market in that field. In any case, for true fans of mixed martial arts as a sport, this is as credible a title matchwith as compelling a sporting narrative as any you are likely to find. The main card is filled out with a few excellent fights, all of which could be expected to headline a Fight Pass card in their own right. Firstly, a featherweight contest between two guys who are no stranger to ‘of the night’ bonuses and had been on the outer edge of title contention before some recent losses in the shape of Dennis Bermudez (14-4) and Jeremy Stephens (23-11). A win for either man really places them back in the mix. Next we have two rising welterweight prospects who met defeat in their last bout against experienced opposition as the exciting Brandon Thatch (11-2) meets smooth Icelander, Gunnar Nelson (13-1-1) looking to recover from losses to Benson Henderson and Rick Story respectively. Both are highly regarded by UFC brass, the media and the fans so the winner here could find themselves a win or two from a title shot. Opening the main card, Brad Pickett (24-10) returns to 135lbs following a disappointing 1-3 run at Flyweight and is rewarded with the dubious honour of facing undefeated prospect Thomas Almeida (18-0). Pickett would be the biggest scalp of Almedia’s career to date, while a win over the impressive youngster would immediately rehabilitate Pickett to his former spot in the top ten of the bantamweight rankings. We’ve also got former Cage Warriors champion Cathal Pendred (17-2-1) looking to impress after a lukewarm start to his UFC career when he faces the ever-game veteran John Howard (22-11) and Neil Seery (15-10)continues his UFC fairytale against Louis Smolka (8-1) knowing that a win would likely place him in title contention given the shallow waters in the flyweight division. For once this is a card which actually seems worth staying up late for so let’s hope it lives up to the hype. This entry was posted in Bite Sized Previews and tagged Brad Pickett, Brandon Thatch, Cathal Pendred, Dennis Bermudez, Gunnar Nelson, Jeremy Stephens, John Howard, Louis Smolka, Matt Brown, Neil Seery, Robbie Lawler, Rory MacDonald, Thomas Almeida, Tim Means, UFC, UFC 189. Bookmark the permalink.